Surgical staples are used to close surgical incisions or wounds that have fairly straight edges. The amount of time staples are kept in varies with the wound and healing rate of the patient. Staples are usually removed at a doctor's office or hospital. This article will give you an overview of how doctors remove surgical staples. 1. Cleanse the wound. 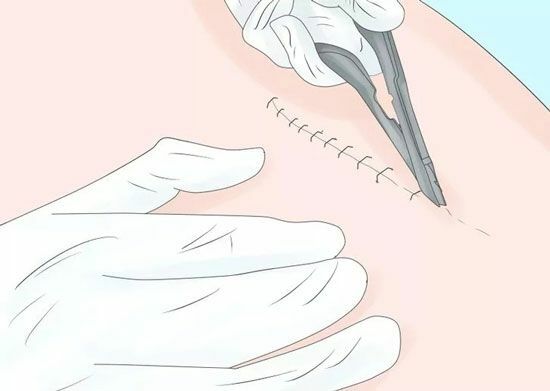 Depending on the condition of the healed incision, use saline, an antiseptic such as alcohol, or sterile swabs to remove any debris or dried fluids from the wound. 2. Slide the lower part of a staple remover under the middle of the staple. Begin at one end of the healed incision. 3. Squeeze the handles of the staple remover until they are completely closed. The upper part of the staple remover will push down the middle of the staple, causing the staple ends to pull out of the incision. 4. Take out the staple by releasing the pressure on the handles. When the staples are removed, drop them into a disposable container or bag. 5. Use the staple remover to remove all the other staples. 6. Cleanse the wound with antiseptic again. 7. Apply a dry dressing or bandage if needed. The type of covering applied depends on how well the wound has healed . 8. Watch for signs of infection. The redness around the closed incision should fade over a few weeks.